Deep Edition is a new UK label which has been consistently impressing over the last few months with some great releases. Seeing talented newcomer Graham Laverty and bona fide deep house legend Nikola Gala on the same release got my attention, and I felt moved to put pen to paper. Sunderland based Laverty is relatively new to the scene but has already gained support from the likes of Richie Hawtin, Nic Fanciulli, DJ Sneak, Timo Maas and Ekkohaus to name a few. His releases so far have been consistently solid, combining Deep and Tech sensibilities seamlessly. 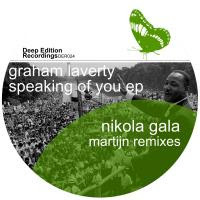 The 'Speaking of You' EP is a debut solo release for Graham on the Deep Edition label, following his excellent remix of Martijn's 'Sweet Sound' back in December 2010. The first track 'Speaking Of You' sees a confident young producer playing with deeper shades of house layered over a solid techy groove. Some lovely percussive touches raise this track above the average, and the bassline drop after the breakdown is sure to produce a special moment when played out. The other original track, Mainline is more of a moody shoe-gazer, perfect for those later sets. Dark and atmospheric bass and vocals bubble over 'straight up' percussion with heavy high hats, making this a real dancefloor prospect. Spotting Nikola Gala's name on any package tends to get us very excited indeed, and I'm happy to report that there was no let down here. Proper vibey, hypnotic driving house music from an on-form producer. Martijn's remix of Mainline completes the package, and very nearly steals the show! Dark, pitched down vocals and heavy sub bass are the order of the day here- truly excellent stuff.